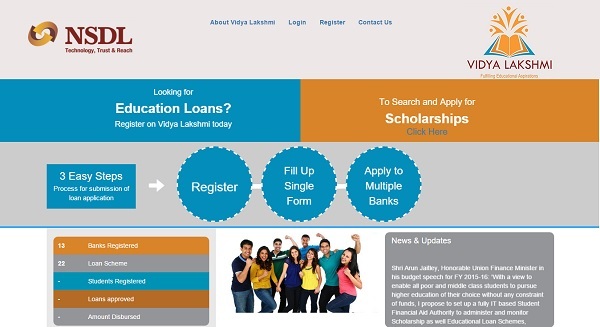 Today Finance Minster launched the Vidya Lakshmi portal (www.vidyalakshmi.co.in). This is the single window for students to apply for educational loans or scholarship. When students look for an educational loan, then they find it hard to get it by visiting individual banks. This portal is one window where you can apply for a loan. Finance Minister in his Budget speech for 2015-16 proposed to set up a fully IT-based student financial aid authority to administer and monitor scholarships as well as educational loan schemes through Pradhan Mantri Vidya Lakshmi Karyakram (PMVLK). What information students can get from this portal? Information about Educational Loan Schemes of Banks. Common Educational Loan Application Form for students. Apply to multiple Banks for Educational Loans. You can download students loan applications. The bank can upload the loan processing status. Students can email grievances/queries related to educational loans to banks. You can view the information related to Govt Scholarships. You can apply to loans by creating a login to the portal. After that, you have to fill up the Common Education Loan Application Form (CELAF). Later on, an applicant can search for a loan based on his need, eligibility and convenience. Common Education Loan Application Form (CELAF) form is a single form to apply for an educational loan for multiple banks. CELAF is the application form prescribed by Indian Banks Association (IBA) and accepted by all banks. This form is provided on Vidya Lakshmi portal to apply for Educational loan. Once your loan approved the same will be updated in a portal by banks. You have to check the status. In case the status showing as loan rejected, then, according to a bank you are not eligible for this loan. For further clarification, you have to contact Bank itself. Sometimes, a bank may update status as ON HOLD. This means that the Bank requires more information from your end and such requirement will usually be available in remark column. Once the loan is approved then the amount will directly transferred to student account without any interference of Vidya Lakshmi Portal. Currently, around 13 banks associated with this portal and they are SBI, IDBI Bank, Canara Bank, Union Bank, Bank of India, Vijaya Bank, Central Bank of India, Corporation Bank, Dena Bank, Kotak Bank and Punjab National Bank. You can apply to the maximum of 3 applications to banks. The interest rate will be as per applicable rules of an individual bank. For further assistance, you can contact NSDL. How can this be useful to students? Instead of applying for separate banks, it acts like a single window platform to apply for 3 banks at a time. This actually reduces your time and energy of approaching different banks. Rohit-It depends on case to case. Check with bank officials. Sir, give the list of documents required to update while filling up application form of vidyalakhami edu. form?